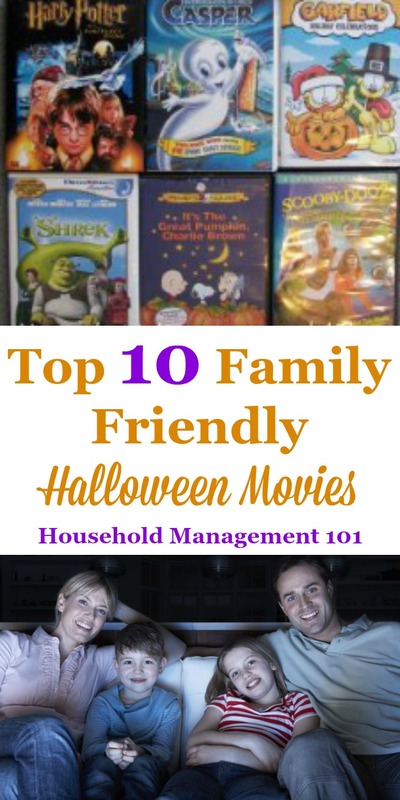 Here are kids' top 10 family Halloween movies, that are not too scary but still enjoyable for everyone. As part of my family's Halloween traditions we watch a movie on Halloween night, after we go trick or treating. Here is a list of some of the favorite ones we generally choose from -- and that you may like too. Note we actually own most of these movies, as you can see from the picture, but not all of them. Many of them are actually Halloween related, while some are just about dressing up, or common Halloween costume characters, or tangentially related to the holiday because they are about ghosts or ogres or something. In general, these family Halloween movies are not, in my opinion, too scary for kids. If there is a scary element I will list it below, with the movie itself. Of course, I realize everyone's beliefs about what is, and is not, a family friendly movie is pretty subjective. Therefore, take the recommendations with a grain of salt, and if you are in doubt preview the movie yourself before you let your child watch it. In addition, you can share your own recommendations for kids Halloween movies below in the comments, plus see what other readers have already recommended. This list of favorite family Halloween movies is really not in a particular order, just the order in which we thought of them for this article. 1. It's the Great Pumpkin, Charlie Brown - OK, you knew this one had to be on the list, didn't you? It is one of my favorites from when I was a kid and it is a classic. I introduced it to my kids who love it too. Linus, of course, believes in the "Great Pumpkin" who will rise out of the pumpkin patch and give boy and girls who believe in him toys and presents. It is pretty short, so we generally watch this one every Halloween and then something else too. The ones we generally choose from are below. 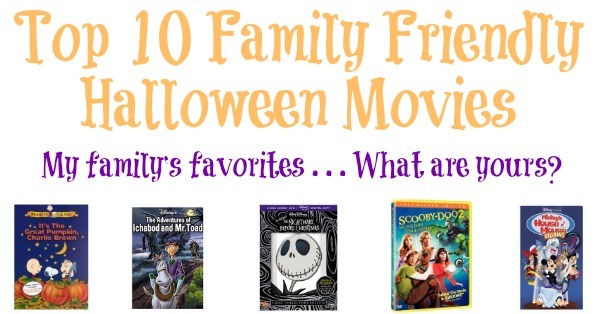 It is actually the first of the three Halloween Disney movies that made this list. It is rated PG, and I could see how it could scare some younger children. We haven't let my 2 year old watch it, for instance. However, I believe school aged children can watch this family Halloween movie. It is about a skeleton named Jack who lives in Halloween town, and discovers Christmas town, and then tries to get everyone to celebrate Christmas instead of Halloween. It is pretty weird, but in a good way, like most Tim Burton movies. It is all stop-motion animation, and has a very neat look to it. 3. The Wizard of Oz - This was a vote from my youngest who is basically obsessed with this movie. It is related to Halloween in that it has a witch, and people are dressed in costumes. You can't argue with that logic, can you? I think everyone knows the plot of this movie -- Dorothy's house is caught up in a cyclone and she is transported to the Wonderful Land of Oz. She desperately wants to get back home, and the story revolves around the friends and enemies she meets along the way. Although I agree it is only tangentially related to Halloween it is a favorite in our house, and the kids love to watch it while in costume, so it is on this family Halloween movies list. The only scary scene, in our opinion, is when the wicked witch first appears on screen. In fact, when my Dad saw it in the theater when he was a little boy during that scene he loves to tell the story of how he jumped out of his seat and ran out of the theater. His Dad, my grandfather, didn't catch him until they reached the lobby! 4. Harry Potter and the Sorcerer's Stone - Any of the Harry Potter movies are a good choice, in my opinion, as a family Halloween movie, but they do get scarier the further along you are in the series. In addition, the first movie does have an important scene on Halloween night, when the troll gets into Hogwarts, so this is the one I chose on our family Halloween movies list. Along with watching, I would encourage each of you to instill the reading habit in your children, and one of the best ways I have found to do this is to encourage my kids to read these books. In addition, my husband and I love them too, and we love to check out the CDs from the library to listen to as a family on road trips! If you've never heard Jim Dale do all the Harry Potter voices, you're really missing out! Here is a link to the entire Harry Potter book series, as read by Jim Dale. You can get them all on Audible, and they're awesome! 5. The Spooktacular New Adventures of Casper - Volume One - As you may recall from your own youth Casper is a friendly ghost, who is friends with a girl named Wendy. 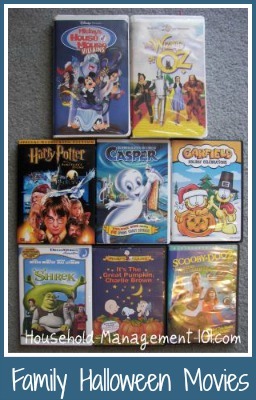 The one we own is the Spooktacular New Adventures, which is a cartoon series that came out after the live action version of Casper came out, which live action movies was, in my opinion, just OK. Of course almost any of the Casper The Friendly Ghost cartoons would be good as one of your family Halloween movies. I should warn that the DVD we have does have the Uncle Ghosts saying things like "shut up" and "stupid" which in our house we call bad words, so you may want to screen it ahead of time if you are also concerned with these types of words. 6. The Adventures of Ichabod and Mr. Toad - This is the second of the Halloween Disney movies in my list, and is also a classic. It tells the story of the Headless Horseman and Ichabod Crane, and also of Mr. Toad's Wild Ride. It is basically a compilation of cartoon shorts which together make up this family Halloween movie. It is spooky, but in my opinion, not too scary for kids, since it has that Disney touch. You may remember watching it on TV as a kid. I know I do. 7. Mickey's House of Villains - this is one of the rarest ones we own, I think. We recently got rid of our VHS player, so I am actually considering getting this one on DVD now because the kids do enjoy watching each Halloween season. It is kind of a tradition in our house to watch this one because it contains all kinds of Disney characters in it when they come together to the "House of Mouse." Obviously, it only contains character that were around at the time it was made, but it is fun to see Ursala, Captain Hook, the Red Queen and more all together. Interspersed with the story of the villains taking over the House of Mouse on Halloween night are several classic Halloween Disney shorts, which the kids really enjoyed. If you can find it it, this family Halloween movie will most likely be a hit in your family, if you love Disney characters. 8. Scooby-Doo 2 - Monsters Unleashed - This is the second Scooby Doo live action movie, and it is also only tangentially related to Halloween. It is about monsters so it makes the cut as one of our family Halloween movies in my book. We have it on our list because there are lots of monsters from the 70's and 80's cartoons which come back to life in this movie, like my personal favorite, the Tar Monster. The plot involves a mad scientist who brings the costumes of villains the gang previously unmasked to life as real life monsters, and sets out to the destroy Mystery Inc. If you watched the first Scooby Doo live action movie and thought it stank, you were right. However, this one redeems itself a little bit and is by far the better of the two. Some of the costumes may be a bit scary, but the action is so slapstick it tends to make it not so scary, even for younger viewers. 9. Shrek - OK, again this movie is only tangentially related to Halloween, but does involve an ogre and a princess, so it aalso made my list. This movie isn't scary at all, but instead is pretty funny for both adults and kids to watch. When I want to actually be entertained too, this movies gets higher on the list than if I'm not watching. The basic story line involves Shrek, an ogre, who is in love with Princess Fiona, who has a secret of her own. The donkey's comedic relief make this movie pretty fun to watch for all ages. 10. Garfield: Holiday Celebrations - This DVD actually contains three different stories on it, only one of which is about Halloween. It also has stories about Thanksgiving and Christmas, and therefore gets played for all three holidays here in our house. The Halloween story on this DVD is relatively scary, in my opinion, but my kids like it because it involves Garfield. If your kids don't even know who Garfield is, I would just skip the Halloween portion of the DVD. On the other hand, even I enjoy the Christmas story on this DVD because it is actually pretty sweet, which is suprising for Garfield. OK, that was my family's top ten family Halloween movies. Now it's your turn. Tell me your favorites below in the comments.